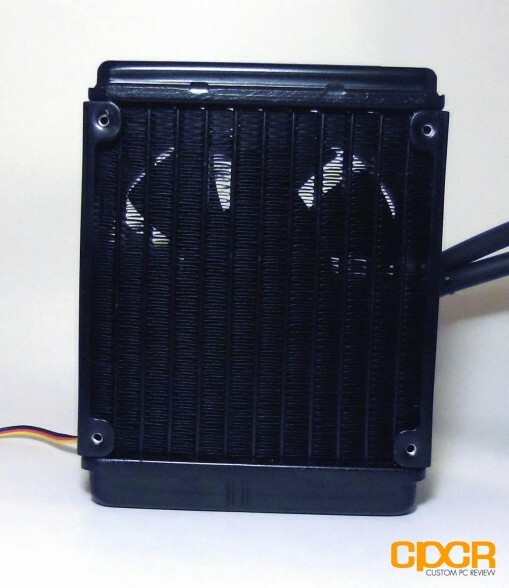 While the CPU cooling market is currently saturated with companies trying to get into the closed loop water cooling market, the GPU cooling market is quite empty when it comes to this type of cooler… until now. 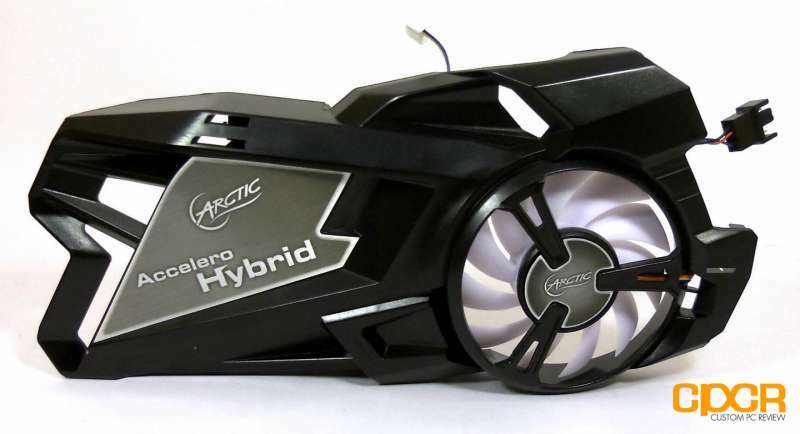 Today, we’ll be reviewing one of ARCTIC’s newest GPU coolers, the ARCTIC Accelero Hybrid. You may be asking yourself “Why is it called a hybrid?” Well, the answer is simple. It’s not actually a full blown water cooler as it still relies on airflow to cool your memory and VRMs; however, the GPU core itself is cooled with an all in one water cooling loop so it’s still “water cooled”. Taking a look at the front of the box we can see a nice graphic of the cooler itself as well as the radiator that is attached. 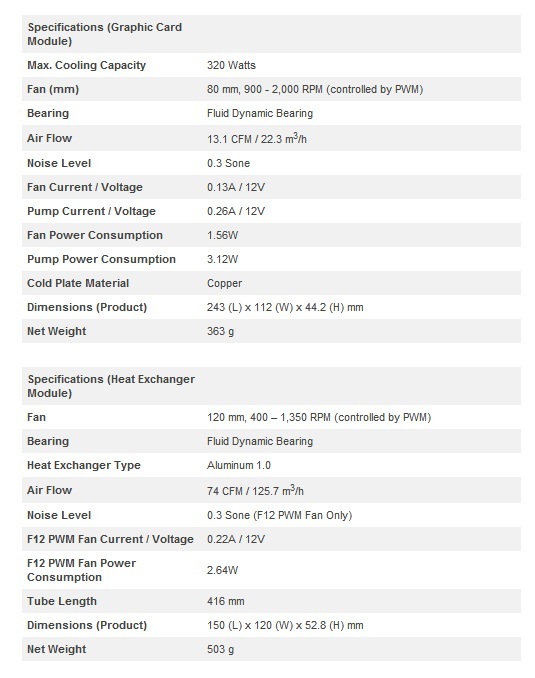 We can also see that it uses ARCTIC’s F12 PWM controlled fan. 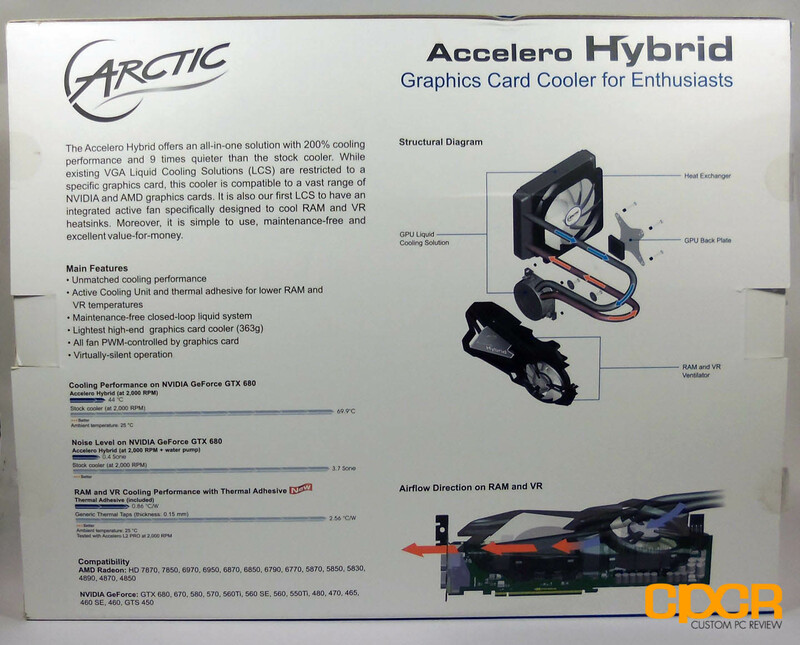 Spinning the box around, we get some of the key features listed and a few graphics which show exactly how the Accelero Hybrid works. 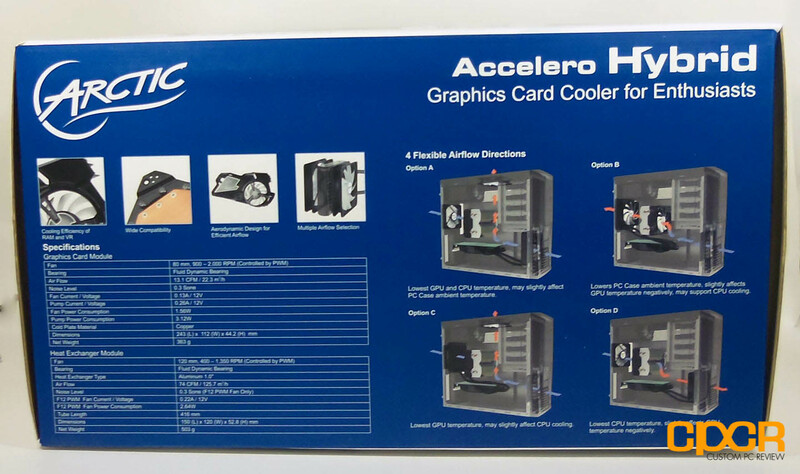 We can also see the long list of graphics cards the Accelero Hybrid is compatible with. Notice how AMD’s 7900 series graphics cards aren’t on the list. That’s because ARCTIC has also introduced an Accelero Hybrid 7970, which is more geared towards the AMD HD 7900/7800 series graphics cards. 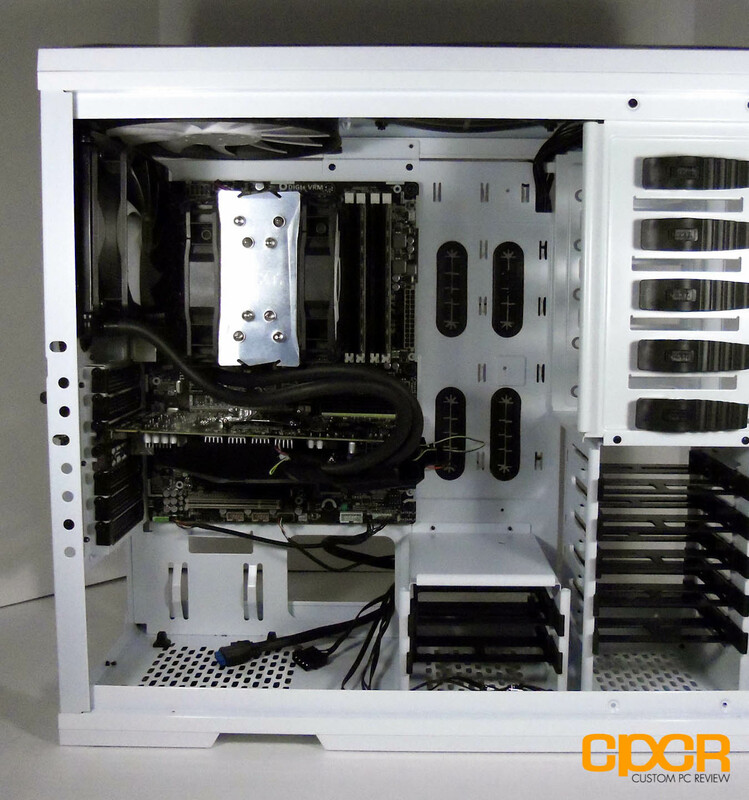 The sides of the box have some more graphics as well as some installation possibilities to ensure that you’re getting optimal airflow and cooling efficiency. Opening the package up, we find the cooler itself suspended in a plastic tray with all of the included VRM and V-RAM heatsinks along with a small tube of ARCTIC’s MX-4 thermal paste. Once we remove the top plastic cover, we we get the closed water cooling loop which is the backbone of the Accelero Hybrid GPU cooler. We can also see the fan and small bag of mounting hardware as well. 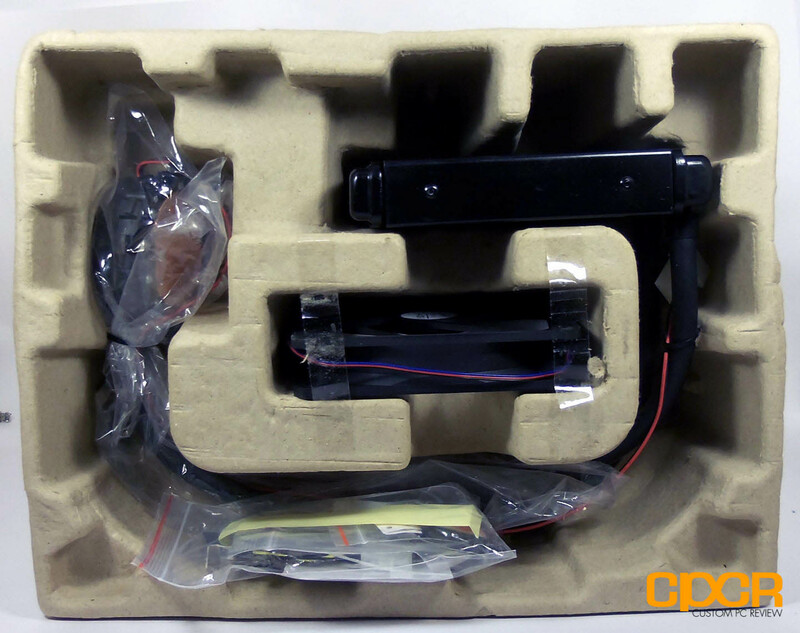 Once out of the packaging, we get all of the included mounting hardware and accessories that are included. 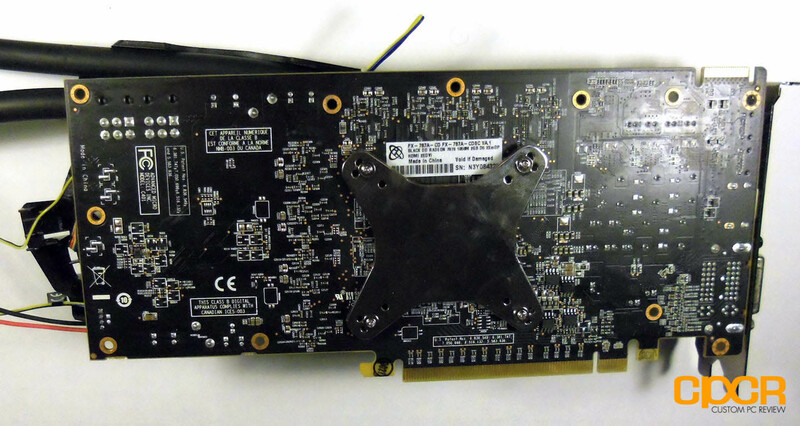 Looking at the front of the cooler, it looks like a pretty normal GPU cooler. 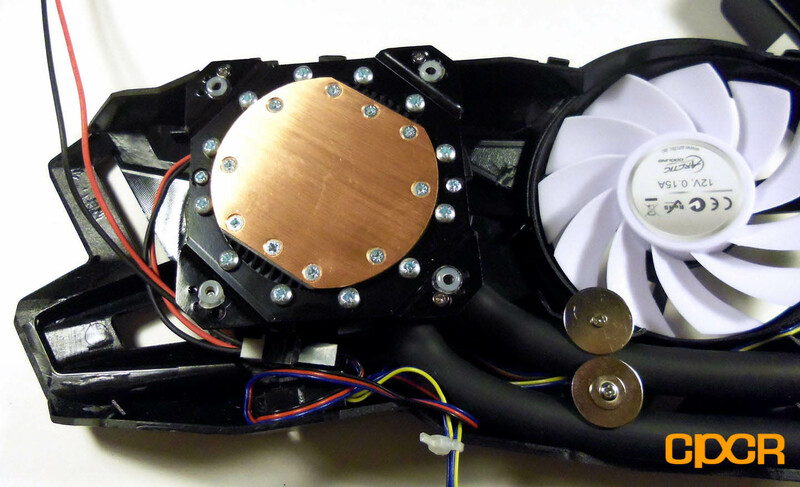 As you can see, all we have here is a small blower fan and a fan connector sticking off to the side. However, after flipping the cooler over, you notice that there’s actually a water cooler under the shroud. 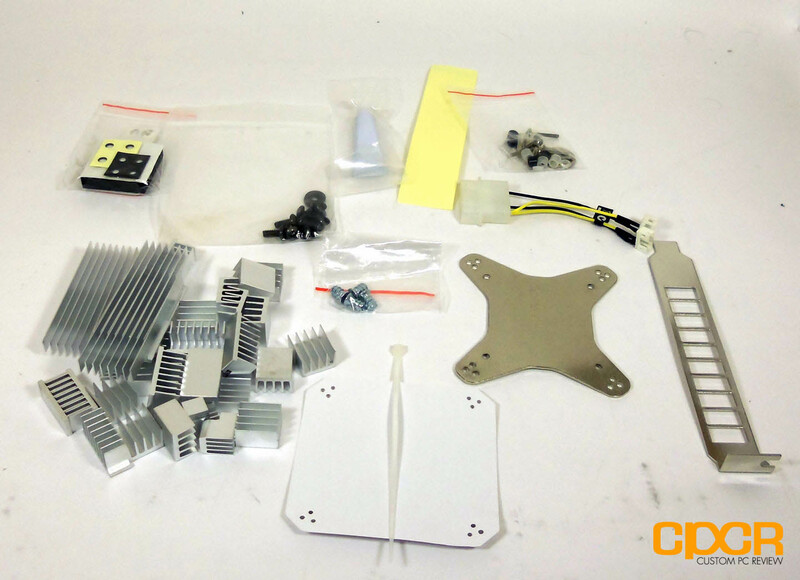 Here, we’ve got the CPU waterblock along with the tubes that connect the waterblock to the radiator. Installing the Accelero Hybrid was pretty straightforward, but it is time consuming, so be sure to read the instructions carefully and do it right. The first step after removing the GPU’s stock heatsink is to install the memory and VRM heatsinks. Be sure to set yourself up with a lot of time as this will take at least 5 hours as the thermal glue used to glue on the heatsinks takes approximately 5 hours to cure. Then, flip the card over and put the rubber/foam backing piece on to ensure you’re not going to short your card out when you put the backplate on. Then it’s as simple as putting your screws through the backplate and the holes in the card and screwing it into the cooler. On the other side of the tubing, there’s a 120mm radiator. Here’s a closer look. 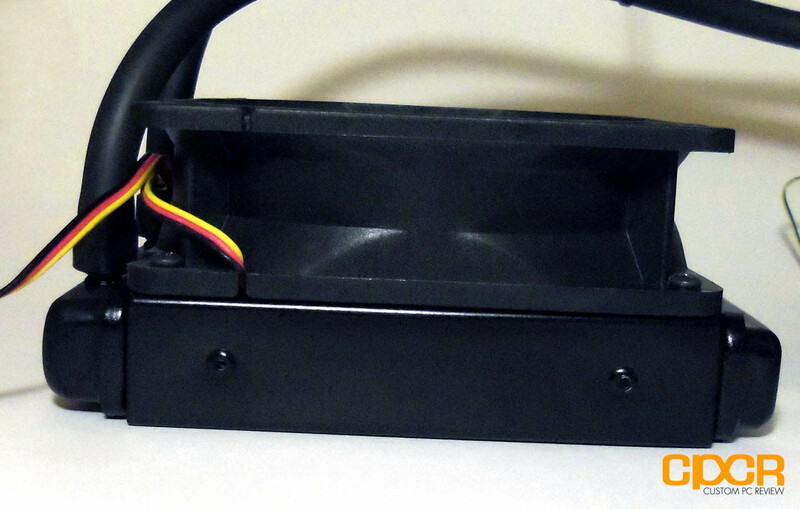 It may be mounted anywhere on the case where there is a free 120mm fan mount. Here it is again, with the fan attached. The design here is quite similar to what we’ve seen on CPU water coolers. 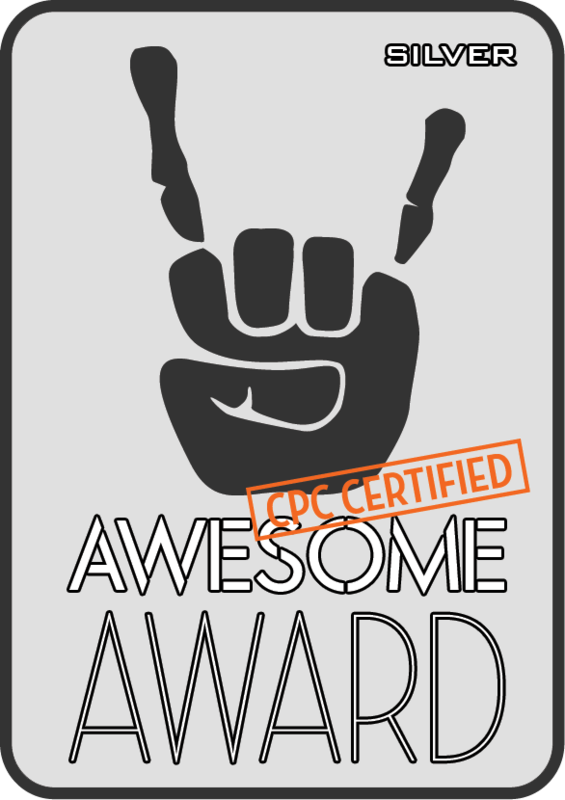 Special thanks to HSPC and OCZ Technology for sponsoring our test bench! For all of my tests I use GPU-Z to monitor the temperatures at load and at idle. Idle temperatures are recorded after having let the computer sit at desktop for 15 minutes. Load temperatures are measured after letting the computer run Furmark for 15 minutes on the default burn-in test. The stock settings used for our GPU was 1050Mhz core and 1250Mhz memory and our overclocked settings were 1250Mhz core and 1450Mhz memory. All coolers will be tested using ARCTIC Cooling MX-4 thermal compound. 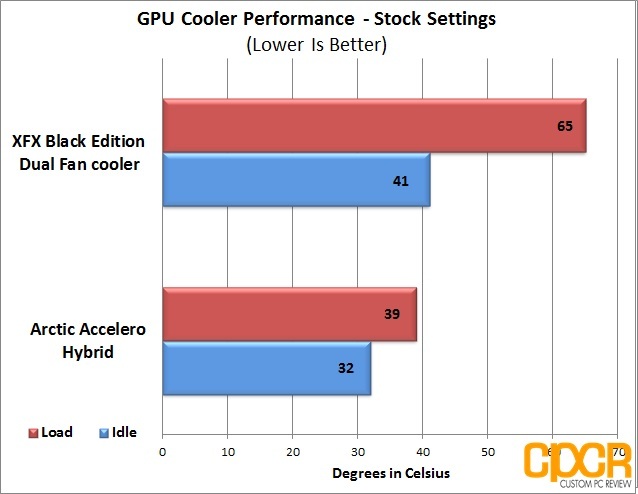 Looking at our stock test results we can see that the Acclero Hybrid was way ahead of the stock cooler on the XFX HD 7850 Black Edition. Additionally, do note that the stock cooler I tested the Hybrid against isn’t a reference cooler, and is actually quite a bit better than the reference cooler. However, most of you aren’t going to be buying a water cooler for your GPU to run it at stock settings. 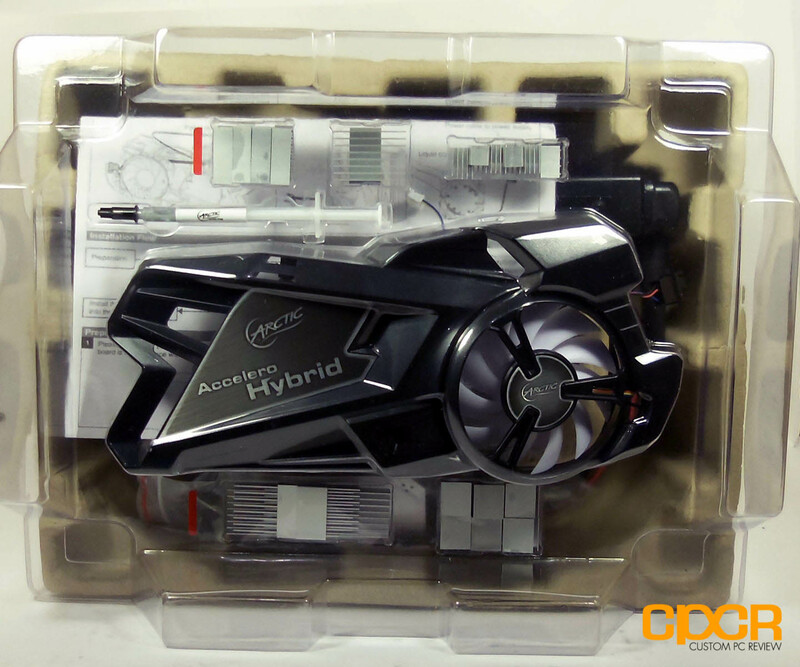 Let’s take a look at our overclocked tests to see how the Hybrid really performs. Here we can see a much larger lead for the Accelero Hybrid. Coming in at just 44°C under load, these results are insanely impressive. This means that there was only a temperature increase of 12°C from idle to load at overclocked settings. The Accelero Hybrid was a whopping 33°C cooler than the custom XFX Double D cooler on the 7850 Black Edition. This isn’t our first run in with one of ARCTIC’s aftermarket GPU coolers, however it is our first run in with an all in one water cooling solution for GPUs. That being said, my experience was overall very pleasant. There weren’t any major speed bumps that caught me off guard or made me regret jumping into this. 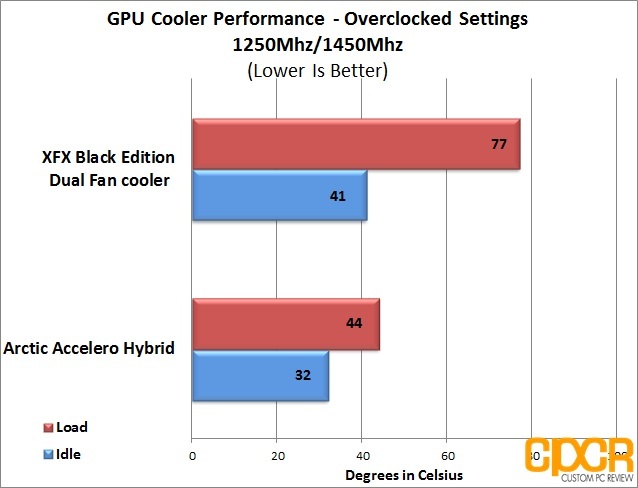 The cooling performance that was achieved with the Accelero Hybrid was unbelievable. I was fully expecting much better temperatures than our stock cooler, but to get a drop in temperatures of as much as 33°C was completely beyond what I was expecting. 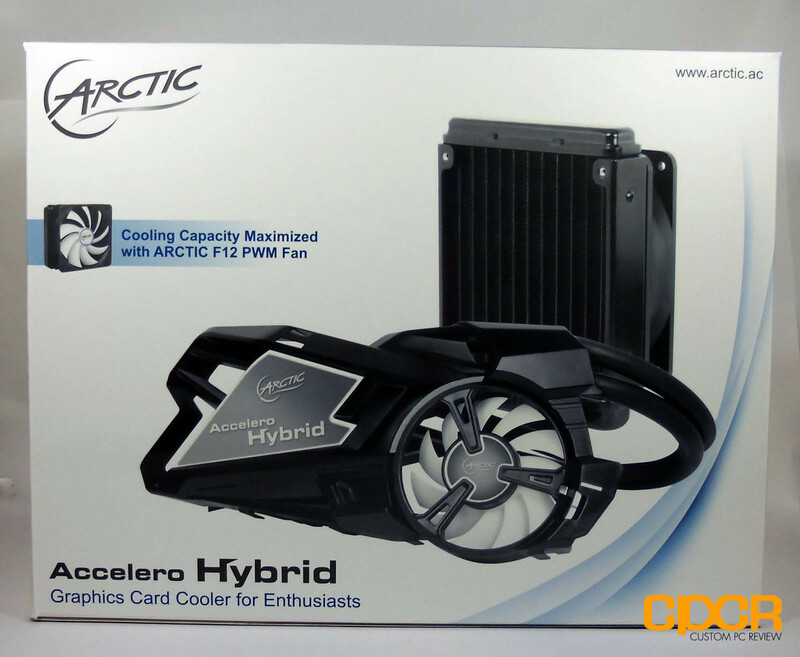 The Accelero Hybrid remained fairly silent throughout all of my testing, mostly due to the PWM fan that ARCTIC bundled with the radiator. I would also like to note that you could increase cooling performance by simply adding another fan, or possibly grabbing fans with higher static pressure. Installing the Hybrid wasn’t super easy although it’s not difficult if you follow the instructions carefully. Like I said earlier though, it’s extremely time consuming. For example, the glue used to mount the VRM and V-RAM heatsinks takes about 5 hours to cure and that’s not counting the amount of time it takes to remove the stock cooler, sort out the parts, and install the rest of the Accelero Hybrid. For those of you who only have one computer, this might be a bit annoying as you’ll be without your graphics card for at least those 5 hours if not longer, but for some this won’t be an issue and will be a small price to pay for a 33°C drop in temperatures. The price of the Accelero Hybrid is it’s biggest downfall. I nearly fell off my chair when I first saw the $169.99 pricetag at Newegg. At $169.99, that’s close to what some of you paid for your graphics cards! If you’re planning on purchasing anything less than a GeForce GTX 660 Ti or a Radeon HD 7950 (Only the Acclero Hybrid 7970 supports AMD HD 7900 series graphics), I’d say this product is not recommended as I’d recommend you just purchase a faster graphics card instead. In fact, even if you have something in the range of say a GTX 660 Ti, buying another GTX 660 Ti to put in SLI for $100 over the cost of an Acclero Hybrid will still get you substantially better graphics performance than going with a single highly overclocked GTX 660 Ti. 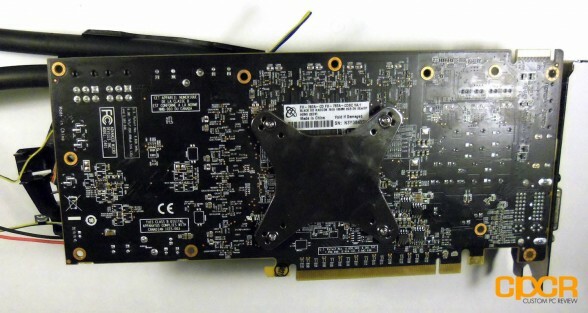 All that said however, a typical high quality full cover GPU waterblock by itself runs in the neighborhood of $100 to $150+ and that’s not counting the tubing, reservoir, pumps, barbs, fittings, etc. that you’ll have to get for the full custom water cooling loop. When put in perspective, $169.99 isn’t bad at all. The Accelero Hybrid is hands down currently the best GPU cooler short of a full custom watercooling setup. It’ll definitely be a worthy purchase for those who want to get the absolute most out of their GPU, but you should definitely be aware of the steep cost of entry. 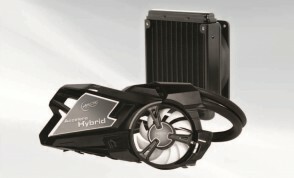 That said, if you already have the fastest graphics card on the market and want to push it as far as you can without having to shell out for a full custom watercooling setup, or don’t want to worry about your custom watercooling setup leaking all over your precious GTX 680, this is the product for you. Special thanks to ARCTIC for making this review possible. The ARCTIC Accelero Hybrid is currently available at Newegg. I can’t stand the price. Better look for other cooler, personally.